The ryanodine receptor (RyR) from cardiac cells and skeletal muscle undergoes a Ca2+-dependent process called adaptation. Adaptation occurs during the slow, spontaneous decrease in the open probability of a channel after it has been rapidly activated by a pulse of cytosolic calcium ([Ca2+]i). RyR activation occurs within milliseconds, whereas inactivation occurs on a timescale of a few seconds. The RyR is said to have "adapted" during inactivation because a subsequent increase in [Ca2+]i produces a nearly identical rise in the open probability. In their 1996 paper, Joel Keizer and Leslie Levine develop a simplified model that mimics the "adaptation" of the RyR, and they investigate its significance for Ca2+-induced Ca2+ release and Ca2+ oscillations in cardiac cells. The mechanism used to mimic adaptation of the RyR is shown schematically in the figure below. States C1 and C2 are closed states and O1 and O2 are open states. Transitions from C1 to O1 and from O1 to O2 are assumed to be Ca2+-dependent. These steps correspond to the phenomenon of Ca2+-induced Ca2+ release (CICR). To analyse the mechanism in the figure , Keizer and Levine translated the schematic diagram into kinetic equations. In addition, they test these equations in a closed-cell kinetic model, and they find that RyR adaptation can cause Ca2+ oscillations. However, in an open-cell, CICR, not RyR adaptation, produces Ca2+ oscillations. The raw CellML description of the kinetic model of cardiac RyR adaptation can be downloaded in various formats as described in . Schematic diagram of transitions among the four states of the RyR used to describe adaptation. States C1 and C2 are closed states and O1 and O2 represent open states, assumed to have the same single-channel conductance. 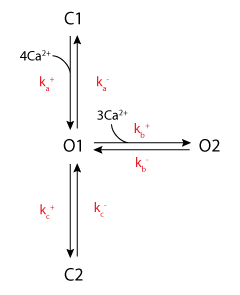 The k are rate constants: only steps a and b are Ca2+ dependent. Derived from workspace Keizer, Levine, 1996 at changeset 5171ef60c764.